Following Canon’s naming convention of adopting lower numbers for higher-spec models, the PowerShot G9 X sits below the G7 X in the range and foregoes the bigger bodies and bulkier, faster high-zoom ratio zoom lenses for a much more slim-line and compact design. Like those models, though, it features a one-inch 20.2-Mpix CMOS sensor with sensitivity up to ISO12,800, but this time it’s not a BSI type. It also has a more modest 28-84 mm-equivalent f/2-4.9 stabilized zoom with a customizable control ring resembling that found on the PowerShot S120. The control ring can be used to adjust a range of settings, such as aperture values, ISO, or exposure compensation. Other features of note include a 3-inch touchscreen LCD with 1.04m-dot resolution (which allows plenty of user control features), a pop-up flash, continuous shooting at 6fps (albeit just 1fps in RAW mode), and, inevitably, HD video (at up to 60fps) and built-In Wi-Fi connectivity with NFC. The new model measures a pocket-friendly 3.9 x 2.3 x 1.2” / 98×57.9×30.8mm, and weighs 7.37 oz / 209g with battery and card. It is available now at a price of $529 (USD). Canon’s diminutive G9 X achieved an overall DxOMark sensor score of 63 points, the same as the sensor in the PowerShot G3 X, but some 8 points fewer than the G7 X at 71 points. For the individual metrics, the G9 X attained a score of 21.5 bits for color sensitivity, a good 12.3 EV for dynamic range at base ISO, and given the sensor size and tech, a respectable low-light ISO score of 495 ISO, which is more-or-less of negligible comparison with the BSI sensor in the G7 X. Although much larger and heavier thanks to its enormous zoom (with 25 x zoom ratio) and larger body, the $1000 PowerShot G3 X achieves the same 63-point overall DxO Mark score as the tiny G9 X, achieves similar individual scores for color depth and dynamic range at all ISOs, and has essentially the same high ISO low-light capabilities. We can therefore assume the G9 X uses a related sensor. The 20.3-Mpix unit in the pricier $700 G7 X, equally tiny as the G9 X, however, is a BSI (backside illuminated) sensor. With the photo diodes placed closer to the light as opposed to simpler conventional front-illuminated designs that stack electronics on top of the photo-receptive layer, BSI sensors (as they’re known) allow more light through, which in principle should lower noise levels and improve color sensitivity, DR, and low-light performance. As for the sensor in the G7X, it shows some improvement in sensor dynamics, but that’s mostly for color sensitivity. Lower noise also translates to a slightly wider dynamic range, but the +0.4 EV advantage at base is quickly matched by the G9 X at ISO 200, and there’s really only a minor improvement in high-ISO low-light capabilities. Canon has only recently started using the one-inch type sensor which Nikon and Sony have used a lot longer. Nikon’s 1-series cameras were among the first to adopt the new sensor format, and the 20.2-Mpix unit in the fifth-generation $500 (body-only) Nikon 1 J5 performs very close to that in the G9 X. It has slightly higher color sensitivity measured at 22.1 bits against the 21.5 bits of the Canon, but in a reversal of trends, Nikon hasn’t been able to pull out quite as much DR, though the differences are marginal at best. Just south of $1,000, the more expensive Sony RX100, now on version VI, has a 20.2-Mpix BSI sensor that is likely to be the same Canon uses in the GX 7. But like each vendor, Sony has optimized the performance somewhat, sacrificing a little DR at base for a slight gain at high ISOs, albeit with some smoothing from ISO3200. Its sensor is the better performer of the three, but the Sony camera is targeting a slightly different audience. Canon’s G-series models offer class-leading performance, but Canon has introduced different classes of G-series cameras, making the choice somewhat more complicated. 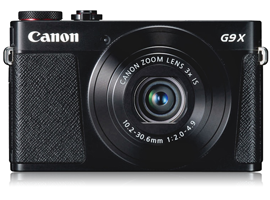 Still aimed at the enthusiast, the G9 X, however, is an entry-level model. It has a decent enough sensor, but it’s not quite in the same class as the BSI sensor found in the G7 X and the rival Sony RX100 IV. It also lacks some other high-end features found on both of those two models, most notably the wider 24mm equivalent field of view and faster maximum aperture at the longer end of the zoom range. The Sony can even boast a built-in electronic viewfinder. The PowerShot G9 X is aimed at a slightly different sub-set, and remains attractive for its small form factor and balance of performance and price.